Notifications are one of the most powerful ways of bringing latent users back to your app. Properly timed and targeted notifications can be vital in increasing engagement. That’s why we’ve redesigned the Firebase notifications dashboard to support much more sophisticated and powerful notification campaigns. The old notifications dashboard let you set up notification campaigns as one-time alerts that could go out immediately, or be scheduled for a later date. For example, with a few clicks, you could set up a notification campaign that would remind new users who failed to complete onboarding to do so on Monday. However, it was not possible to automate this reminder to go out every Monday – unless you did it manually. 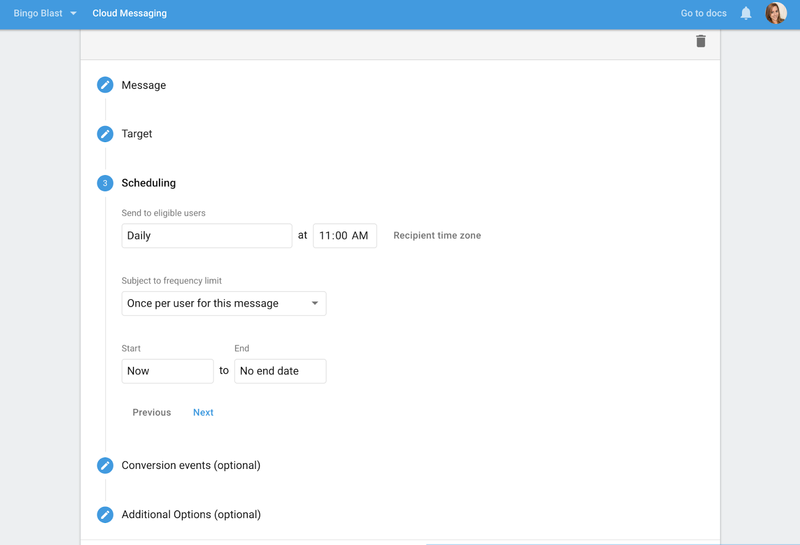 In the new Firebase notifications dashboard, we have added the ability to create recurring campaigns. Recurring campaigns are notification campaigns that run automatically, whenever a user meets the targeting conditions. Now, it’s easy to set-up that weekly reminder to encourage new users to complete onboarding. Or, perhaps you want to offer bi-weekly discounts on in-app purchases to spenders to nudge them towards a purchase – that’s also possible! The new notifications dashboard allows you to set user-level message frequency caps, so you can limit the number of times a user gets a message to prevent spamming them. You can limit messages to only be sent once per user, or allow one message over a specified number of days. Perhaps you want to send a welcome message once to each new user. Use a single message to target every new user once. Or, perhaps you want to encourage users to check out a tutorial on how to use the app. You can send a notification once every few days to guide them towards the action until it’s been completed. And since targeted segments are dynamic, users who meet the criteria will automatically start receiving notifications, and users who no longer meet the criteria will stop receiving the targeted notifications. This means your notification will only be delivered to users who find it relevant. Untargeted batch and blast notifications are annoying and can cause churn. It’s vital to carefully segment the right users so your notification appears welcome and relevant to their recent interaction with your app – not out of place and random. The new notifications dashboard includes a more sophisticated segment builder that gives you the ability to target prevalent user characteristics, like last app engagement and the number of days since they first opened the app. This targeting is built into the dashboard, so you don’t have to add any code to get these new parameters. Finally, we also improved the results section of the notifications dashboard so you can better monitor the performance of your campaigns and make adjustments as needed. 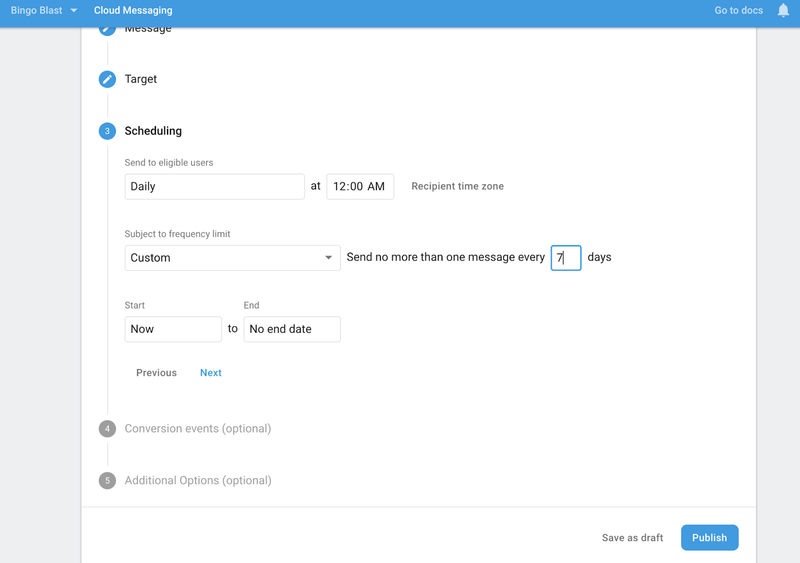 In the new notifications dashboard, you can now track the effectiveness of recurring campaigns day-by-day. Here, you can see daily data points for notification sends, opens, and conversions. You’ll also notice that the graphs have been updated from a bar chart to a time-series graph, which are more intuitive and easier to interpret. The redesigned Firebase notifications dashboard offers new, powerful campaign options, sophisticated targeting, and rich analytics to track the progress of your notifications campaigns. If you’re new to Firebase notifications, get started with the Firebase Cloud Messaging guides. Check out the Firebase console to set up your notification campaigns today!